When La Sirène launched their first can, the Urban Pale, it helped bring the Alphington brewery to a new audience. Now, with their second canned release, one imagines they may help bring sour beers to a new audience. It would be in keeping with their mission, as stated on the cans, to create "Farmhouse For The People". Let's start with the cans, as you're not going to miss them when you walk into any bottleshop with them in stock. Featuring similar stylings to the Urban Pale and the brewery's Avant Garde bottled range, they come in a shimmeringly bold and bright orange. And it's the ideal signpost for what's to come. 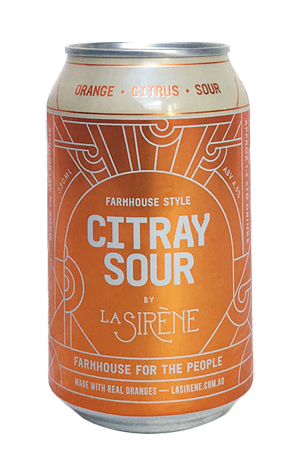 Originally a draught only release at the end of 2017, Citray Sour is another La Sirène beer that combines plenty of aromatic, fruity hops, the (urban farm)house yeast, fruit and the native lactobacillus (and whatever else) inhabits the brewery. It's a combination that delivers a beer that doesn't hold back on the sour side – particularly for a core range beer – with an acidity that's nothing short of bracing. The other star is the fruit, in this case locally sourced oranges that add a zestiness and characters reminiscent of a tart, freshly squeezed OJ.